Here are the finalists for our first Christmas lunch with all-British wines. On the left a sparkling white aperitif from the Ancre Estate Welsh vineyard just outside Monmouth which earlier this month won an Italian prize for the best sparkling wine in the world (and that included competitors from Champagne). In the middle a choice of white (from the Astley vineyard in Worcestershire) or a red, a Gamay, from Biddenden 2011 in Kent recommended by those nice people at Wine Pantry. 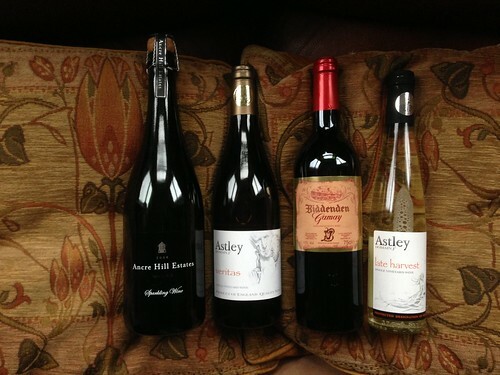 If we last out until pudding there is a late harvest desert wine, also from Astley.